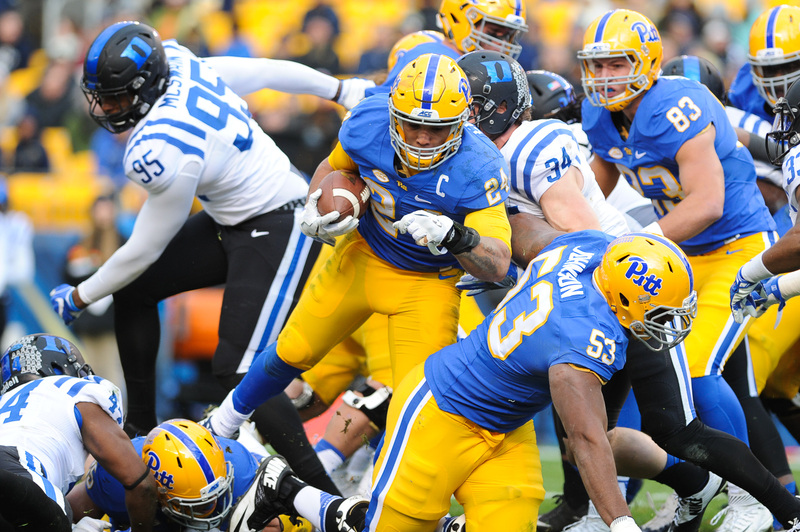 The last time the Pitt football team broke out its retro uniforms, the Panthers needed every page in their playbook to pull out a win, as a last-second stop sealed the game against Georgia Tech in early October. Donning the royal blue-and-mustard yellow outfits for the second time this season on Saturday, Pitt had no such trouble. The Panthers (7-4 overall, 4-3 ACC) dominated from start to finish to pull off their most lopsided victory of the season, crushing the visiting Duke Blue Devils (4-7 overall, 1-6 ACC) at Heinz Field, 56-14. After winning the toss and deferring to the second half, Pitt came up with a big play on defense immediately. On Duke’s second play from scrimmage, Pitt linebacker Oluwaseun Idowu poked the ball loose from Blue Devils running back Shaun Wilson. Panthers linebacker Matt Galambos scooped the ball up and returned it eight yards to the Duke 17. Pitt capitalized on the turnover, as quarterback Nathan Peterman found wide receiver Dontez Ford wide open in the middle of the end zone on third down for the first score of the game. Thanks to a long kick return by Wilson and some quick screen passes by Duke, that lead wouldn’t last long. First, Wilson’s 40-yard kick return set the Blue Devils up at their own 41-yard line. Duke receiver T.J. Rahming then caught a short pass from quarterback Daniel Jones and took it 43 yards inside Pitt’s 10-yard line, setting up a six-yard touchdown pass from Jones to wideout Chris Taylor to even up the game at 7-7. But the Panthers found the end zone again on their next drive, as a bruising 21-yard rush by redshirt junior running back James Conner set him up for a one-yard touchdown plunge. The score tied Conner for career ACC records in both total touchdowns and rushing touchdowns. Conner would leave the game after the score after suffering what appeared to be an ankle injury, although Narduzzi wouldn’t confirm what the injury was. With the focal point of the offense out, wide receiver Quadree Henderson took center stage. The electrifying sophomore took a jet sweep 52 yards for a touchdown, extending Pitt’s lead to 21-7. The two teams traded possessions without scoring, as both offenses stagnated. But Duke was able to score via defense, as Peterman threw a pass directly to cornerback Bryon Fields, who returned the interception for a 36-yard touchdown. The Pitt quarterback redeemed himself on the team’s next possession. Facing a third-and-long, Peterman uncorked a perfect long ball to wide receiver Jester Weah, who hauled in the throw for a 56-yard touchdown to extend Pitt’s lead to 28-14 as the half neared its end. Duke had a chance to score before the end of the half, but kicker A.J. Reed missed a 31-yard field goal as time expired. Despite the two-touchdown lead, Narduzzi wasn’t thrilled with his team’s first-half performance. The Panthers wouldn’t give their coach much to complain about in the second half. On another big third down coming on the team’s first drive of the half, Peterman once again connected on a deep heave to Weah, who took the ball 39 yards to the Duke 1-yard line. Conner returned to the game to start the second half for the first time since his touchdown run and immediately made an impact. He followed a 23-yard run on the second play of the half with another one-yard touchdown three plays later. The score made him the ACC’s all-time career leader in both rushing touchdowns and total touchdowns, with 50 and 53, respectively. The redshirt junior tailback expressed how grateful he is to the Pitt program for giving him a chance as an fairly unheralded high school prospect out of Erie, Pennsylvania. After a Duke three-and-out, Henderson shined again, this time putting the contest out of reach. The dynamic all-purpose weapon ran back a punt 65 yards for a touchdown — his fourth return touchdown of the season — to push the Panthers’ lead to 42-14 early in the third quarter. The return was Henderson’s first punt return touchdown of his career. He already had four kick return touchdowns in the team’s past 11 games. Pitt continued to pile on in the fourth quarter, as Peterman once again connected on a big pass play, this time to tight end Scott Orndoff. Peterman fired a throw off his back foot for a 48-yard touchdown, and the score sat at 49-14 with 9:01 left in the game. After Duke fumbled the ensuing kickoff and Pitt recovered, Peterman went to the bench and backup quarterback Manny Stocker came in for his first bit of action. The Panthers would score again on a two-yard rush by Qadree Ollison, extending the advantage to 56-14. The 56 points were a season high for Pitt, and the total gave the team 432 points on the year, a program record. The Panthers conclude their regular season next Saturday at Heinz Field, as they take on the Syracuse Orange on Senior Day. Kickoff is set for 12:30 p.m.